Advantech Embedded Software provides different solutions to ensure your IoT security, including backup cloud solutions, embedded BIOS, OS, API Library, and integrated service platforms in WISE-PaaS Marketplace. 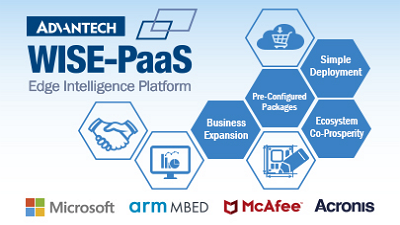 WISE-PaaS Alliance is the IoT partner program launched by Advantech that helps partners solve IoT application challenges and take those applications to market. With six Diversify Software Solutions, partners can unify different protocol standards, thus enabling data, image, device and network management, and ensuring that IoT device and data infrastructure is reliable and scalable. Alliance programs also provide development tools, professional consultant and technical support service and VIP IoT Developer Forum. Advantech provides embedded security solutions like Mcafee security and Acronis backup and recovery solutions that can meet specific requirements for protection in embedded applications. Advantech provides a series of real-time OS services for Advantech platforms, including Wind River VxWorks, Pulsar Linux OS and Android Solutions. Advantech provides Wind River VxWorks BSP porting services and Pulsar Linux OS which is a container-based OS designed to deliver a steady flow of bug fixes and security vulnerability fixes.